Although testing is a very important component in any AngularJS application, I have left it out for this series as AngularJS Testing will be covered as a separate article using tools like Karma and Jasmine. 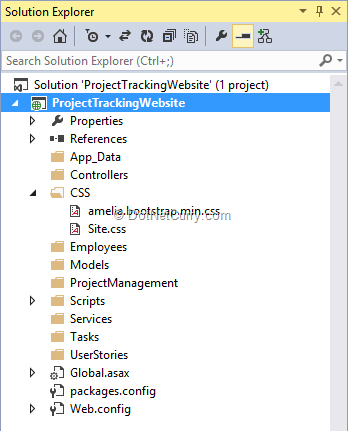 For building the Project Tracking website, we will use the following technologies - HTML5, CSS3, Bootstrap, ASP.NET Web API, Entity Framework, AngularJS and SQL Server 2012. The FREE tools to build the Project Tracking website are – Microsoft Visual Studio Express 2013 for Web or the latest Visual Studio Community Edition AND SQL Server Express with Management Studio . Let us dive into some concepts first. The HTML page in SPA is a single page which is sent by the server when the application requests for it. Then based on the user interaction, the browser requests the other HTML pages called as Views asynchronously as a resource. To load or navigate between different views, most of the SPA technologies offers Routing services. Why Angular JS and what is AngularJS? 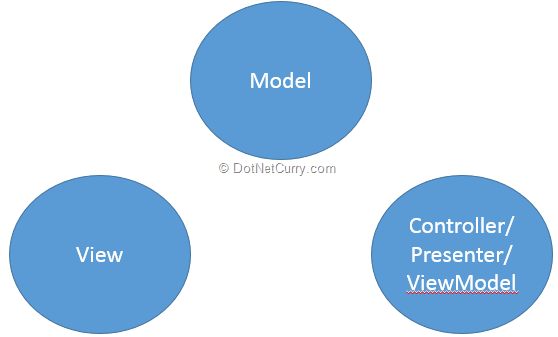 Model – View – ViewModel etc. We will follow the Model – View – Controller pattern. Model is where you store your data. It could be in-memory data or data which can be fetched from databases like Microsoft SQL Server. View is what you want to display in the end users browser. Controller contains the logic and the state which you can make use of inside a view. AngularJS can make asynchronous calls to RESTful server APIs and presents the data to the Models. It returns promises which we can use to fetch the data. 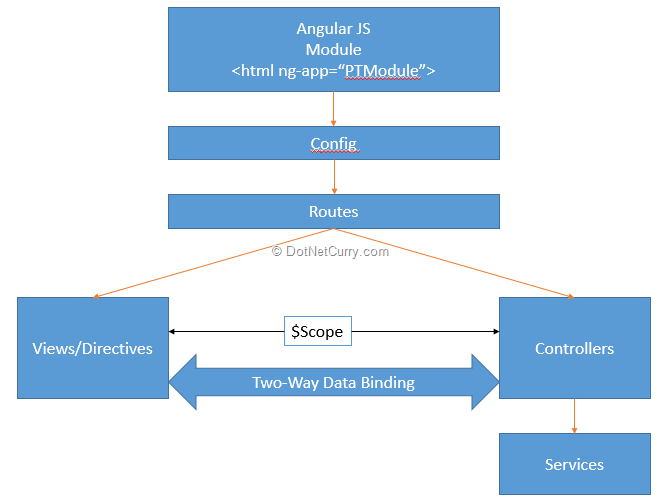 AngularJS also provides routing capabilities using which you can navigate between different views. Let us briefly discuss the important components of AngularJS. Testing is easier and faster as you need to load only those modules which are needed by the app. Configuration – needed to inject the constants and providers into configuration blocks. Config block is executed as soon as the module loads. The routing configuration is done in the configuration. It can also be used to configure modules and add HTTP interceptors. Routing – When you design a large application, you cannot build the entire application using a single controller or a single view. You will need multiple controllers and multiple views. In such situations, you will have to do a navigation between different views using routing. Controller – Controllers contains the logic and share state. Controllers are in-charge of your application and build the models for the views and directives. You can create multiple controllers for your application. Controller also provide commands for the view to act upon using number of events. Views – View is nothing but the information you want to render to the end users browser. A view is also called as AngularJS compiled DOM. Directives - Directives are extensions to HTML. They extend HTML instead of manipulating HTML. AngularJS provides a number of directives out-of-box. For example - ng-app, ng-controller, ng-view, ng-repeat etc. You can also build your own custom directives. Two-Way Binding - AngularJS provides two-way data binding out-of-the-box. When model changes, the view reflects the changes without waiting for any specific event to be fired. Also, when view updates the model, the model gets updated automatically. Now that we have gone through some concepts, we will move forward and design the database which will store the data of our Project Tracking website. To design the database and tables, open SQL Server Management Studio and execute the following script. Manager Comments – Manager can add comments on the tasks which are in progress. Now let’s decide the structure of our web site and add required references to the structure and do the initial setup for our Project Tracking website. I will be using Microsoft Visual Studio Express 2013 for Web to build the web site or the latest Visual Studio Community Edition and will use NuGet packages to install the required library references into our website. Open Visual Studio and create a new Web Application by choosing the ASP.NET Web Application with an Empty Project template. Add an empty folder with the names CSS, Scripts, Images, Controllers, Services, Employees, Tasks, ProjectManagement, UserStories into our project. Add a style sheet file with the name Site.css into the CSS folder. 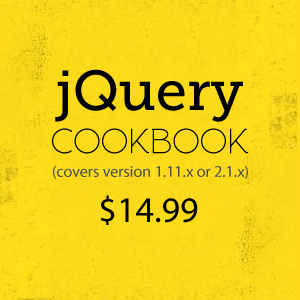 Add Angular JS files, jQuery using NuGet package into our Scripts folder. This is shown in the image below. To make the website Responsive and look and feel better across multiple devices, I have downloaded the Bootstrap theme Amelia from http://bootswatch.com/# and added the CSS file into to my CSS folder. If you do not find Amelia in the themes, feel free to download any other theme of your choice. Now let’s start modifying this project a bit and add angular support to the same. To use AngularJS in our website, we have already added an AngularJS script reference into our page Home.html. The code is shown above. Now we need to add a directive which is ng-app in to our HTML. This directive is an application level directive which AngularJS will look for and start evaluating the AngularJS expressions. This directive can be added into <HTML> tag or <body> tag or any other HTML tag like <div>. AngularJS will evaluate the HTML DOM which is under the HTML tag applied with the ng-app directive. The double curly brackets are known as binding expressions. You can bind the data which may come from collections, web services or from databases using Angular expressions. Now let’s add ng-app directive to the <body> tag and you will see the same output. Now that we have briefly used AngularJS, we will go ahead and design our first HTML page for the rest of the tutorial series. Replace the Home.html page with code shown here. I have added some more scripts and designed our Project Tracking website using Twitter Bootstrap. Please note that we will use this application for the entire series. You can see all the employees details with their skill sets to assign the appropriate tasks and do efficient project management. Build the web application to manage the projects online through out the organization. 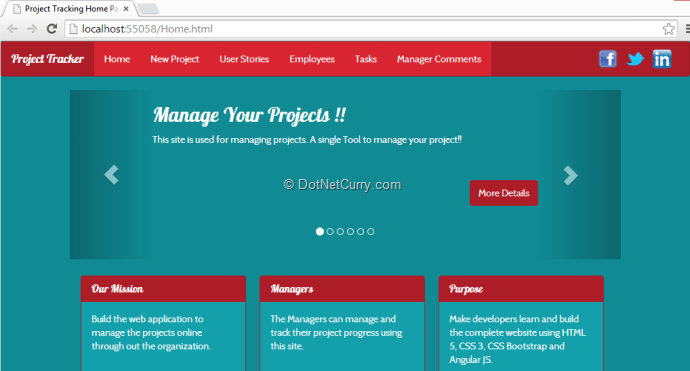 The Managers can manage and track their project progress using this site. Make developers learn and build the complete website using HTML 5, CSS 3, CSS Bootstrap and Angular JS. &copy;All Rights Reserved by DotNetCurry. That’s it for this article. In the next article, we will see how to Create REST Service using ASP.NET Web API to serve data to our views. Concise and extremely informative. Well written. I Will keep in touch with you if I have any doubt/clarification. Never knew MVC with AngularJS would be so easy in the first step. Thank you so much! Where is the source code for this application , Can you you please share the code . Good post . But webconfig some dll missing so i canot run this then why use this project ProjectTrackingServices how to refer this ProjectTrackingWebsite can u help me. your project not working in vs 2013 community. I meet this issue can you solve this issue thats helpful for me.